Dr Fortuno is a magic inspired slot from Yggdrasil Gaming that has 5 reels and 20 paylines. Featuring Dr Fortuno and his troupe of misfits (Water Witch, Fire Head and the Night Twins), there’s a Wheel of Fortuno feature where you can win cash prizes, multipliers up to 5x, more spins, the chance to win the progressive jackpot and the jackpot itself. The Free Spins feature gives you up to 3 modifiers to see high value characters transform into wilds, more Fortuno wilds, a 2x multiplier, low value symbols removed from the reels, more free spins and win both ways payouts. All you need to do is walk this and it’s all fun and games inside Dr Fortuno’s Carnival. Dr Fortuno is powered by Yggdrasil Gaming and comes with 5 reels 20 paylines. Playable from 10p to £100 a spin across all devices including smartphones and tablets, you head to Dr Fortuno’s travelling carnival. With a magic theme, it comes with free spins, the Wheel of Fortuno and a Fortuno Jackpot feature. 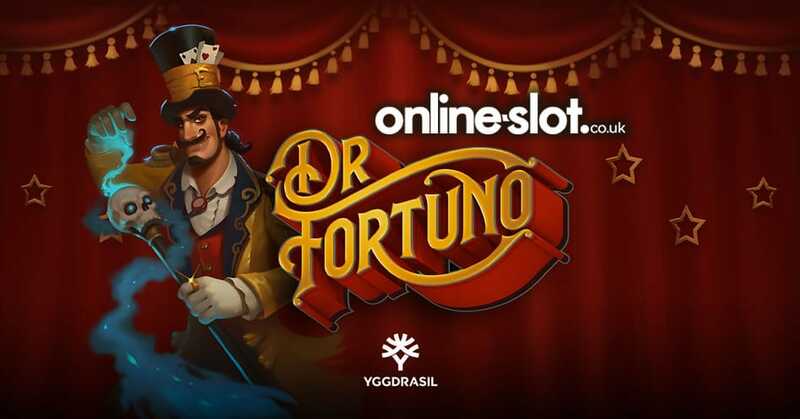 Visually, Dr Fortuno is rather good – as are all Yggdrasil Gaming slots. Set inside Dr Fortuno’s travelling carnival, this mysterious and magical offering has a creepy soundtrack. Symbols on the reels include 4 different coloured potion bottles as well as Dr Fortuno’s troupe of misfits – you will see Water Witch, Fire Head and the Night Twins which all appears 3-high. The latter is the most rewarding symbol with 3, 4 or 5 on a payline giving you 4, 6 or 20 times your stake. If you hit the Jackpot Chance field, the Jackpot field is unlocked – if you then hit this, the Jackpot is won. The amount won is shown to the left of the reel set and is progressive! Now, if you win the low paying symbols removed extra, all the potion symbols won’t appear. A 2x multiplier doubles your outcome. If you get more Fortuno Wilds on the reels, you will be able to trigger the Wheel of Fortuno feature more easily. 1 of the characters (Water Witch, Fire Head or the Night Twins) can also transform into a wild for even more wins – these transformed symbols just substitute for all symbols and don’t nudge. Dr Fortuno looks superb – 1 of the best I’ve come across. The bigger wins will come in the Free Spins feature where you’d hope to benefit from the 2x multiplier, high value symbols becoming wild and more Fortuno Wilds on the reels. If you manage to fill the reels with wilds, you will pocket 400 times your total stake. Do this with the 2x multiplier and you could win 800 times your stake on each free spin. Variance wise, Dr Fortuno is in the middle and has the right balance between win potential and gameplay – it does look terrific and offers the chance to win a progressive jackpot. As you’d expect, another great slot from Yggdrasil Gaming – I recommend you try some of their other superb titles with Dwarf Mine and Wolf Hunters my recommendations.